Egyptian hieroglyphs (/ˈhaɪər.ɵɡlɪf/ hyr-o-glif) were a formal writing system used by the ancient Egyptians that combined logographic andalphabetic elements. Egyptians used cursive hieroglyphs for religious literature on papyrus and wood. Less formal variations of the script, called hieratic and demotic, are technically not hieroglyphs. The word hieroglyph comes from the Greek adjective ἱερογλυφικός (hieroglyphikos), a compound of ἱερός (hierós ‘sacred’) and γλύφω (glýphō ‘Ι carve, engrave’; see glyph), in turn a calque of Egyptian mdw·w-nṯr (medu-netjer) ‘god’s words’. The glyphs themselves were calledτὰ ἱερογλυφικὰ γράμματα (tà hieroglyphikà grámmata) ‘the sacred engraved letters’. The word hieroglyph has become a noun in English, standing for an individual hieroglyphic character. As used in the previous sentence, the word hieroglyphic is an adjective, but is often erroneously used as a noun in place of hieroglyph. Hieroglyphs emerged from the preliterate artistic traditions of Egypt. For example, symbols on Gerzean pottery from ca. 4000 BCE resemble hieroglyphic writing. 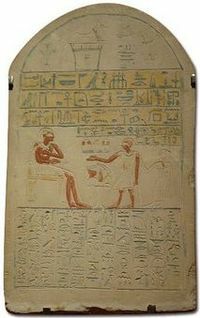 For many years the earliest known hieroglyphic inscription was the Narmer Palette, found during excavations at Hierakonpolis (modern Kawm al-Ahmar) in the 1890s, which has been dated to ca. 3200 BCE. However, in 1998, a German archaeological team under Günter Dreyer excavating at Abydos (modern Umm el-Qa’ab) uncovered tomb U-j of a Predynastic ruler, and recovered three hundred clay labels inscribed with proto-hieroglyphs, dating to the Naqada IIIA period of the 33rd century BCE. The first full sentence written in hieroglyphs so far discovered was found on a seal impression found in the tomb of Seth-Peribsenat Umm el-Qa’ab, which dates from the Second Dynasty. In the era of the Old Kingdom, the Middle Kingdom and the New Kingdom, about 800 hieroglyphs existed. By the Greco-Roman period, they numbered more than 5,000. As writing developed and became more widespread among the Egyptian people, simplified glyph forms developed, resulting in the hieratic (priestly) and demotic(popular) scripts. These variants were also more suited than hieroglyphs for use on papyrus. Hieroglyphic writing was not, however, eclipsed, but existed alongside the other forms, especially in monumental and other formal writing. 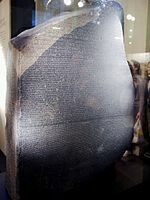 The Rosetta Stone contains three parallel scripts – hieroglyphic, demotic, and Greek. Hieroglyphs continued to be used under Persian rule (intermittent in the 6th and 5th centuries BCE), and after Alexander the Great‘s conquest of Egypt, during the ensuing Macedonian and Roman periods. It appears that the misleading quality of comments from Greek and Roman writers about hieroglyphs came about, at least in part, as a response to the changed political situation. Some believe that hieroglyphs may have functioned as a way to distinguish ‘true Egyptians‘ from some of the foreign conquerors. Another reason may be the refusal to tackle a foreign culture on its own terms which characterized Greco-Roman approaches to Egyptian culture generally. Having learned that hieroglyphs were sacred writing, Greco-Roman authors imagined the complex but rational system as an allegorical, even magical, system transmitting secret, mystical knowledge. By the 4th century, few Egyptians were capable of reading hieroglyphs, and the myth of allegorical hieroglyphs was ascendant. Monumental use of hieroglyphs ceased after the closing of all non-Christian temples in 391 CE by the Roman Emperor Theodosius I; the last known inscription is from Philae, known as The Graffito of Esmet-Akhom, from 394 CE. As active knowledge of the hieroglyphs and the related scripts disappeared, numerous attempts were made to decipher the hidden meaning of the ubiquitous inscriptions. The best known examples from Antiquity are the Hieroglyphica (dating to about the 5th century) by Horapollo, which offers an explanation of almost 200 glyphs. 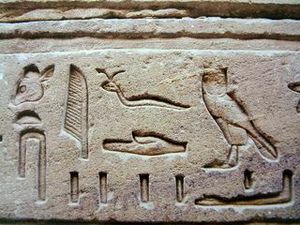 Horapollo seems to have had access to some genuine knowledge about the hieroglyphs as some words are identified correctly, although the explanations given are invariably wrong (the goose character used to write the word for ‘son’, zꜣ, for example, is identified correctly, but explained wrongly to have been chosen because the goose loves his offspring the most while the real reason seems to have been purely phonetic). The Hieroglyphica thus represent the start of more than a millennium of (mis)interpreting the hieroglyphs as symbolic rather than phonetic writing. In the 9th and 10th century CE, Arab historians Dhul-Nun al-Misri and Ibn Wahshiyya offered their interpretation of the hieroglyphs. In his 1806 English translation of Ibn Wahshiyya’s work, Joseph Hammer points out that Athanasius Kircher used this along with several other Arabic works in his 17th century attempts at decipherment. Kircher’s interpretation of the hieroglyphs is probably the best known early modern European attempt at ‘decipherment’, not least for the fantastic nature of his claims. Another early attempt at translation was made by Johannes Goropius Becanus in the 16th century. Like other interpretations before it, Kircher’s ‘translations’ were hampered by the fundamental notion that hieroglyphs recorded ideas and not the sounds of the language. As no bilingual texts were available, any such symbolic ‘translation’ could be proposed without the possibility of verification. Kircher further developed the notion that the last stage of Egyptian could be related to the earlier Egyptian stages. Hieroglyphs survive today in two forms: directly, through half a dozen Demotic glyphs added to the Greek alphabet when writing Coptic; and indirectly, as the inspiration for the original alphabet that was ancestral to nearly every other alphabet ever used, including the Roman alphabet. This article contains IPAphonetic symbols. Without properrendering support, you may seequestion marks, boxes, or other symbols instead of Unicodecharacters. Visually hieroglyphs are all more or less figurative: they represent real or illusional elements, sometimes stylized and simplified, but all generally perfectly recognizable in form. However, the same sign can, according to context, be interpreted in diverse ways: as a phonogram (phonetic reading), as a logogram, or as an ideogram(semagram; “determinative“) (semantic reading). The determinative was not read as a phonetic constituent, but facilitated understanding by differentiating the word from its homophones. Most non-determinative hieroglyphic signs are phonetic in nature, meaning the sign is read independent of its visual characteristics (according to the rebusprinciple where, for example, the picture of an eye could stand for the English words eye and I [the first person pronoun]). This picture of an eye is called a phonogram of word, ‘I’. Twenty-four uniliteral signs make up the so-called hieroglyphic alphabet. Egyptian hieroglyphic writing does not normally indicate vowels, unlikecuneiform, and for that reason has been labelled by some an abjad alphabet, i.e., an alphabet without vowels. Thus, hieroglyphic writing representing a pintail duck is read in Egyptian as sꜣ, derived from the main consonants of the Egyptian word for this duck: ‘s’, ‘ꜣ’ and ‘t’. (Note that ꜣ ( , two half-rings opening to the left), sometimes substituted with the digit ‘3’, is the Egyptian ayin). As in the Arabic script, not all vowels were written in Egyptian hieroglyphs; it is debatable whether vowels were written at all. Possibly, as with Arabic, the semivowels /w/ and /j/ (as in English W and Y) could double as the vowels /u/ and /i/. In modern transcriptions, an e is added between consonants to aid in their pronunciation. For example, nfr “good” is typically written nefer. This does not reflect Egyptian vowels, which are obscure, but is merely a modern convention. Likewise, the ꜣ and ʾ are commonly transliterated as a, as in Ra. Hieroglyphs are written from right to left, from left to right, or from top to bottom, the usual direction being from right to left (although for convenience modern texts are often normalized into left-to-right order). The reader must consider the direction in which the asymmetrical hieroglyphs are turned in order to determine the proper reading order. For example, when human and animal hieroglyphs face to the left (i.e., they look left), they must be read from left to right, and vice versa, the idea being that the hieroglyphs face the beginning of the line. Each uniliteral glyph once had a unique reading, but several of these fell together as Old Egyptian developed into Middle Egyptian. For example, the folded-cloth glyph seems to have been originally an/s/ and the door-bolt glyph a /θ/ sound, but these both came to be pronounced /s/, as the /θ/ sound was lost. A few uniliterals first appear in Middle Egyptian texts. However, it is considerably more common to add, to that triliteral, the uniliterals for f and r. The word can thus be written as nfr+f+r but one reads it merely as nfr. The two alphabetic characters are adding clarity to the spelling of the preceding triliteral hieroglyph. – ḫ +p +ḫpr +r +j (the 4 complementaries frame the triliteral sign of the scarab beetle) → it reads ḫpr.j, meaning the name “Khepri“, with the final glyph being the determinative for ‘ruler or god’. Besides a phonetic interpretation, characters can also be read for their meaning: in this instance logograms are being spoken (or ideograms) and semagrams (the latter are also called determinative). Those are just a few examples from the nearly 5000 hieroglyphic symbols. Determinatives or semagrams (semantic symbols specifying meaning) are placed at the end of a word. These mute characters serve to clarify what the word is about, as homophonic glyphs are common. If a similar procedure existed in English, words with the same spelling would be followed by an indicator which would not be read but which would fine-tune the meaning: “retort [chemistry]” and retort [rhetoric]” would thus be distinguished. All these words have a meliorative connotation: “good, beautiful, perfect”. A recent dictionary, the Concise Dictionary of Middle Egyptian by Raymond A. Faulkner, gives some twenty words which are read nfr or which are formed from this word. A filling stroke is a character indicating the end of a quadrat which would otherwise be incomplete. However, many of these apparent spelling errors constitute an issue of chronology. Spelling and standards have varied over time, so the writing of a word during the Old Kingdom might be considerably different during the New Kingdom. Furthermore, the Egyptians were perfectly content to include older orthography (“historical spelling”) alongside newer practices, as though it were acceptable in English to use archaic spellings in modern texts. Most often, ancient “spelling errors” are simply misinterpretations of context. Today, hieroglyphicists use numerous catologuing systems (notably theManuel de Codage and Gardiner’s Sign List) to clarify the presence of determinatives, ideograms, and other ambiguous signs in transliteration. Here the ‘house’ hieroglyph works as a logogram: it represents the word with a single sign. The vertical stroke below the hieroglyph is a common way of indicating that a glyph is working as a logogram. Here the ‘house’ glyph stands for the consonants pr. The ‘mouth’ glyph below it is a phonetic complement: it is read as r, reinforcing the phonetic reading of pr. The third hieroglyph is a determinative: it is an ideogram for verbs of motion that gives the reader an idea of the meaning of the word. 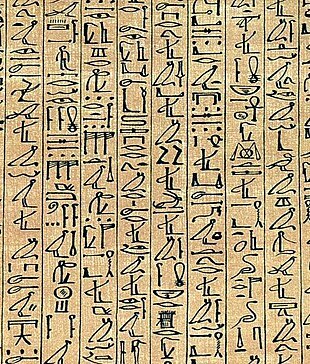 Egyptian Hieroglyphs were added to the Unicode Standard in October, 2009 with the release of version 5.2. As of July 2013, three fonts, “Aegyptus“, NewGardiner.ttf, and Noto Egyptian Hieroglyphics support this range.